So here we are, the final month of Recipes for Life, the challenge I launched back in February with the charity SWALLOW to help its cookery club find tasty new recipes for members to make themselves. We decided to go right back to basics for this last challenge and our final three ingredients are milk, eggs and flour. You can’t get more basic than that now, can you? 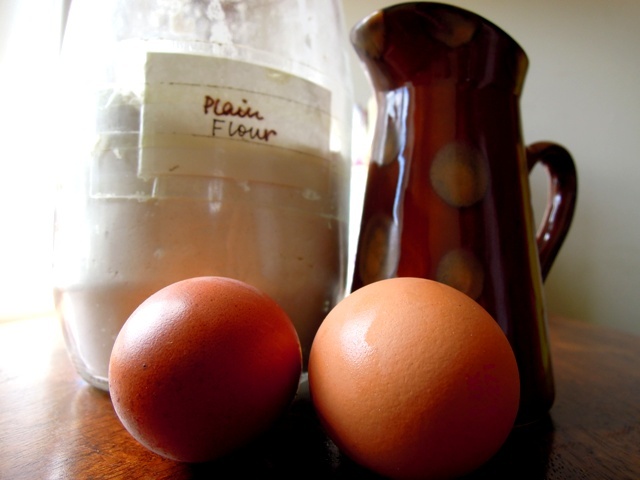 What would you make with eggs, milk and flour? The options are wide open. Sweet or savoury; breakfast, lunch or dinner (or breakfast, dinner or tea! ), or even supper – the choice is yours. As ever you can add any extra ingredients you fancy but just please make sure they are the kind of thing you’d find in most fridges or store cupboards, or else easily and cheaply available in any supermarket or grocery store. Full guidelines on how to take part are below. The plan is to include the best recipes from the seven months of the challenge in SWALLOW’s new cookery book. SWALLOW is a Somerset-based charity, supporting adults with learning disabilities to lead more independent lives. They run a wide range of programmes for its members, empowering them with the skills and experiences to live their lives to the full, from therapeutic art courses and drama groups to domestic and work-based training. We’ve had a fantastic response from the food blogging community to date, offering a diverse collection of tasty, cheap and easy dishes made from everyday ingredients. Let’s see if we can make this month the best month yet! Display the Recipes for Life badge (shown above and available here) on your recipe post, and link back to this challenge post. You may enter as many recipe links as you like, so long as they are based on the three main ingredients selected for this month and accompanied only by everyday items. Send your recipe URL to me at vanesther-at-reescommunications-dot-co-dot-uk, including your own email address and the title of your recipe or post. The closing date this month is Saturday 31 August 2013. If you tweet your post, please mention #RecipesforLife, @BangerMashChat and@SWALLOWcharity in your tweet and we will retweet each one we see. Feel free to republish old recipe posts, but please add the information about this challenge and the Recipes for Life badge. As entries come in, links to these will be added to this page and at the end of the month there will be a round-up of all entries received. SWALLOW staff and members will choose their favourite recipe at the end of each month, and the winner will receive a small prize. A selection of recipes entered each month will be featured in the SWALLOW cookbook to be published later this year, helping the charity to raise much-needed funds for its ongoing work. We really look forward to seeing your entries this month, and you never know – there might be a special prize as it’s the final challenge. You’ll just have to wait and see! Hi Hazel – thanks for stopping by. Nothing in the rules says the recipe must be in English – I could always use Google Translate! I have sent you the link to my Pea-nut-ella Rolls. The challenge really sounds gr8 and its a pity I only found out about ir recently. Good luck with your book.